When Innistrad was released, it stamped its identity from the outset with its selection of Intro Packs, resulting in a wonderfully evocative quintet. The tribal call was put out with Spirits, Vampires, and Humans each getting their own deck to showcase their latest incarnations. The flashback mechanic was given space on the stage with Eldritch Onslaught, and morbid had its turn with the somewhat disappointing Deathly Dominion deck. The other two significant innovations were left out- dual-faced cards were too complicated, and the curses just weren’t enough to carry a deck (much like imprint in Scars of Mirrodin). Dark Ascension has given us some diversion from the narrowly-focused formula. While there is a tribal deck (the Zombie-plagued Relentless Dead), we get two “tactical” decks in the Red/White Swift Justice and Black/Green Grave Power. These latter two decks don’t wrap themselves around a specific keyworded mechanic, but rather rely on some general archtypes (Boros beats-n-burn and graveyard filling). Of the two new keywords introduced for the set- fateful hour and undying, one of them almost certainly falls into the ‘unsustainable’ category, a supplemental mechanic that might be sprinkled about but not anchored on. That leaves undying, which brings us to today’s deck, Monstrous Surprise. The idea behind undying is a simple one, taken right out of the world of horror movies. Namely, the monster is never really dead when you think it is. 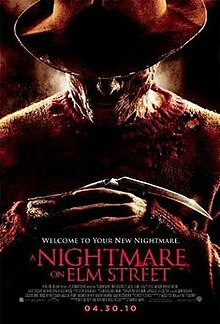 Entire franchises have been built around that simple premise, that when the hero has vanquished the monster, the monster has one last surprise in store (see: Nightmare on Elm Street, Friday the 13th, etc). For undying, not only does the monster come back, but with a renewed sense of purpose driving it it’s bigger than ever before. As a quick aside, should you find yourself sitting across the table facing down a stampede of undying creatures, by the way, you’ll have Mark Rosewater’s wife to thank. As related by Rosewater in his Making Magic column, she provided the inspiration for the mechanic. Looking at undying, it’s a fairly straightforward mechanic, one that augments a deck rather than has the deck built around it (like metalcraft, for instance, which you’d never splash without adequate artifact content). That means that in order to be properly supported, it needs to be grafted onto an existing deck archetype, and here we find just the deck- Red/Green beats. Generally in a Red/Green beats frame, you tend to pass up the earliest drops in favour of stating to out-muscle your opponent beginning at around turn 3. Another characteristic is a fat tail- a larger-than-average collection of the more expensive closers. The downside here is that such an array ups the overall mana curve, and yields a greater number of suboptimal opening hands. To offset the expense, such decks often lean upon mana ramp to ensure a timely deployment, and the good news here is that Monstrous Surprise is little different. Still, with a larger number of early plays, you’re less likely to be caught out in the start of the game. To begin with, the deck provides you with a pair of Goblin Arsonists and trio of Young Wolves. The Wolves are your first undying creature, and are quite a steal for a mere apiece. Not only do you lead off with a 1/1 body, but once your opponent finally decides to kill it, it’s right back in the game as a 2/2. As a 1/1, the Wolves won’t be breaking down many doors on offense, but they are a great way to get in a few early nicks, and if you are off to a slow start, they’re quite adept at stalling the game a bit through chump blocks to buy you some precious time. Don’t overlook the usefulness of those Goblins, either. The 1-point ping they can deliver won’t want for targets in the Innistrad-block environment, where there seem to be an impressive number of x/1 bodies standing about. They, too, make superb stallers, chumping to prevent damage to you while then being popped to kill off something else. The deck takes a bit of a dip at the two-drop slot, though with undying represented in the Young Wolf that shouldn’t be a worry. Here you get a pair of Strangleroot Geists, a nudge more powerful than the Wolves that can come back as 3/2’s. Unusual for Green, they also have haste. 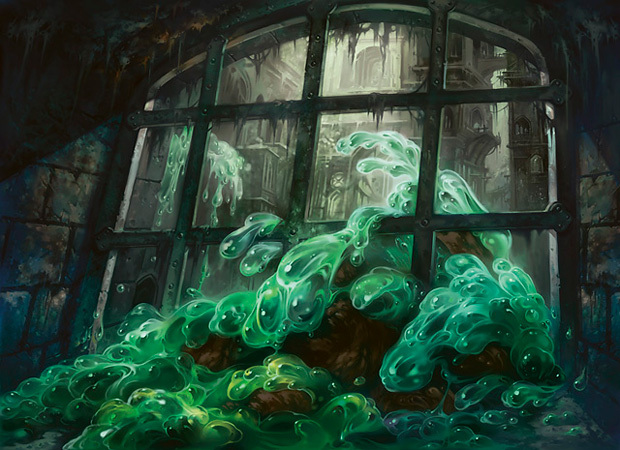 Wizards has confirmed that haste is an occasional keyword in Green, as evidenced by the fact that there’s only one other creature in the current Standard environment that bears it (Putrefax). Things start moving in the other direction beginnign with the three-drops, which give you two cards each of two different options. The Pyreheart Wolf brings more undying goodness to the deck, as well as a very punishing blocking restriction for your opponent. Anyone who’s been up against a Kederekt Creeper or Stormblood Berserker knows how annoying this can be to defend against. Then there’s the pseudo-evasive Orchard Spirit, another 2/2 body which will be difficult to defend against. So far, we’re looking at a relentless ground game, with creatures that refuse to die paired with creatures that are difficult to deal with on the attack. From this point, the focus of the deck shifts a bit, looking to take advantage of the double-mortality of many of your creatures. 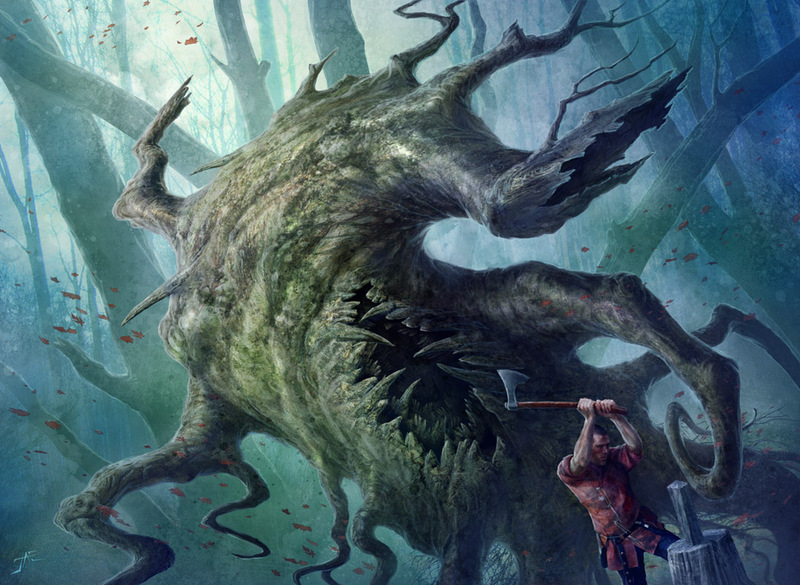 The Lumberknot, for instance, starts off small but can grow quite large as the bodies start to pile up- all the while being protected against your opponent’s removal by its hexproof. Also in the four-drop slot we find two plain 3/3 vanilla Russet Wolves, and a pair of Skirsdag Cultists. The Cultists turn a creature into a Shock, and since with undying the creature comes back even stronger than before, this opens up some tactical plays that can break through a red zone stall in addition to providing an extra bit of burn. Finally, we get to the deck’s endgame closers, the 5- and 6-drops. Pitchburn Devils carry the same power/toughness of the Russet Wolves, but for that one mana more they also have a death-triggered Lightning Bolt at their disposal. Sacrificed to the Skirsdag Cultist, that gives you a full 5 points of damage to direct wherever you wish, and at instant speed. You also get a trio of Nearheath Stalkers, which is probably two too many. That’s not to say a 4/1 undying Vampire that comes back as a 5/2 isn’t useful, but its probably safe to say that by the time you’re able to cast this, your opponent will likely be in position to defend against it. After all, a mere 1/1 Spirit or Human token can trade with it the first time, and then it can be brought low by any simple 2/2 body. Creatures with massive power coupled with feeble toughness don’t tend to last long as an offensive threat. From there we find a Rage Thrower, a somewhat pricey body with a splendid repeatable burn effect. Like the Vampire, there’s a very real risk that it will come out too late to be particularly useful, but it can set up game-winning attacks whereby your opponent is effectively checkmated- dead if they don’t block, and dead if they do. Having 4 power is not insignificant, either, as the damage ability of the Thrower is a passive trigger and doesn’t care if he’s tapped or untapped. Then there’s the Flayer of the Hatebound, another 4/2 body that happens to be the deck’s premium foil rare. In this case, the lower toughness is almost an asset, because you can get the most out of it by having it die- a full 5 points of damage to fling at either your opponent or their best creature. Have a care, though, that you’re not putting him at risk by doing so- since his ability affects all your undying creatures, it’s a high value card to have in play. We’ve noted before how Red often tends to get cards that deal damage for using that set’s mechanic. See, for instance, Burning Vengeance for flashback, Rage Extractor for Phyrexian mana, or Rumbling Aftershocks for multikicker. Typically it’s in the form of an enchantment, but the Flayer slides in right next to the Extractor for bucking the trend. A solid card and great inclusion here. The noncreature support for Monstrous Surprise tends to follow the established pattern for such decks. You have a bit of creature pump in a pair of Wild Hungers, which thansk to flashback can be used twice. There’s a touch of much-needed ramp in Rampant Growth, as well as a very welcome closer card in Overrun. The removal suite- when taken onboard with the direct damage several of the deck’s creatures are capable of- is quite robust by Innistrad block’s standards. A pair of Prey Upons help the strong gobble up the weak, while Rolling Temblors look to bathe the ground in flames and kill anything with a toughness less than 3. This is a great example of a symmetrical card that becomes asymmetrical in the right context. With your undying creatures coming back with that +1/+1 counter, you can often improve your board position even when bathing your own creatures in friendly fire. There’s also a pair of Flings, superb cards here again when paired with undying. For the odd artifact or enchantment, you have recourse to a singleton Naturalize, also something we typically see in these sorts of builds. The final two cards are a rather odd pair. 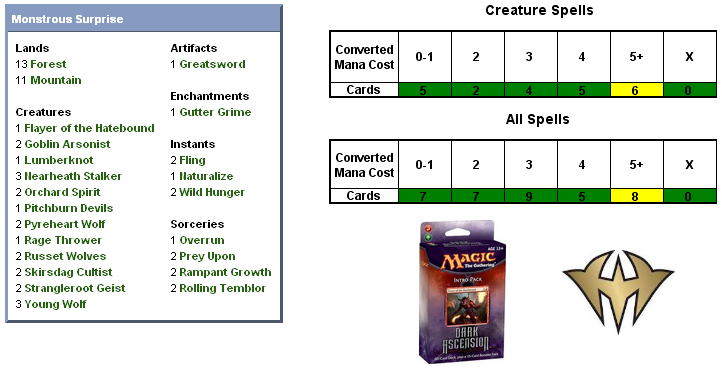 To boost your creatures you get some equipment in the form of the mediocre Greatsword. This deck might have been a worthwhile home for the Demonmail Hauberk instead, but that card was drafted by the Dark Sacrifice deck instead, so this is what you get. Finally, we find the deck’s other rare here in a Gutter Grime. Much hay has been made about the policy Wizards introduced for Intro Packs beginning in New Phyrexia, where the decks would get a rare from the base set and one from the set the decks were released with. Gutter Grime is a solid choice here, if a bit pricey, though it doesn’t take much to get a return out of it. Although initially we were quite disappointed with this change in policy, which hit its nadir with a lousy Tower of Calamities in Feast of Flesh, in places where it works, its a welcome addition. We’d be more in favour of a policy that simply pulled a second rare which made sense to the deck rather than mandating one from each (whether it be two from Dark Ascension, or one from Dark Ascension and the other from Innistrad, whichever built the better deck), but so long as it is carefully applied we have little cause for complaint. Gutter Grime works in a deck where lots of your creatures will be dying. Ooverall, the undying twist to Monstrous Surprise gives it a very flavourful twist on the traditional Red/Green beats deck, and we’re excited to put it into play. We’ll pit it against some opposition, and report back to give it a final analysis and a grade. Traditionally r/g beats were held by steep mana curves and lack of card advantage in the late game. I think undying goes a long way towards solving the latter, but seeing eight cards cost five or more might hurt it against aggro decks with faster creatures, like Dark Sacrifice. Ah, overrun. I don’t think I’ll ever get tired of seeing you in precon land. Greatsword on the other hand… well, the deck overall is a bit fragile and top-heavy, but I can see it working. There is a surprising amount of removal in here, albeit most of it creature based. Rage Thrower and Gutter Grime in particular are interesting inclusions, being somewhat gimmicky limited fodder from Innistrad that get some synergistic love now that Dark Ascension is added to the mix. On another note, I think it will be interesting to see how the general build and philosophy of this R/G undying deck compares to that of the G/B event deck.